Quoted in the bibliography as an influence, and reading almost like an homage to Testament of Youth, Hilary McKay’s latest novel The Skylarks’ War is a highly readable, beautifully imagined story of a girl coming of age during the devastation of World War I. Clarry and her older brother are largely ignored by their single parent father, but spend their summers in glorious freedom in Cornwall at their grandparents’, where wonderfully charismatic and free-spirited cousin Rupert rules the roost. 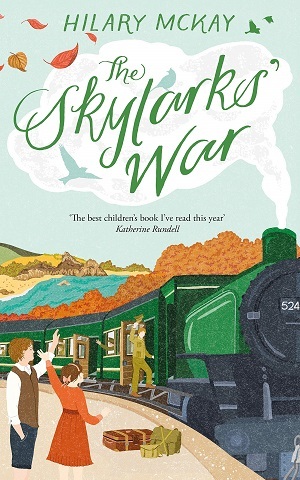 But when war breaks out, family and friendships are wrenched apart, and the Skylark summers seem a thing of the distant past. McKay has a remarkable gift for writing. Her characters are fully rounded, developed people who you want to stay with long after the last page is turned. Clarry reads like a warm hug, Rupert is exactly the heroic soldier one would fall for, and Clarry’s brother Peter is a complicated, sensitive sort – he heart-wrenchingly jumps from a moving train to avoid boarding school and damages his leg, with only the reader fully aware of the consequences of his actions, seeing as war will erupt a few years later. Also lending heart and soul to the novel is Simon, Peter’s friend from boarding school, who gives the reader a glimpse of the social history of the piece from the knowing standpoint of a more enlightened future. Simon, as much as the reader, is patently in love with Rupert, but of course homosexuality was forbidden then. 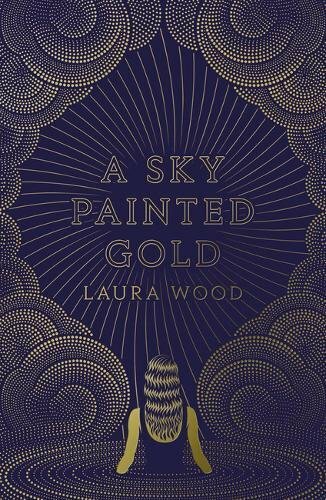 As well as character, McKay writes with specificity, elegance and precision in her portrayal of the time, lavishing period detail, but more intelligently, rendering the emotions of the time so clearly – leaving the reader with a sense of the social history without in any way preaching. She shies away from anything too gruesome in her sparse prose about the Front, but there is enough tension and heartbreak to transport the reader to the desolation of that time and place. McKay concentrates mostly on the home front, managing to include both the suspension of time for women left at home as they waited for news and letters, but also the occupying of that time and the growth of importance of women as they took up roles in society away from the domestic sphere, and become more visible. Above all, what marks the book is the amount of hope and courage portrayed, and the feeling that Clarry’s breathless determination and grit will prevail. This sort of storytelling is reminiscent of those great classic novels – the gathering of the family around letters from Father in Little Women, the closeness in relationships in Noel Streatfield novels, the insight into women’s feelings in Testament of Youth. Marking the centenary of the First World War, this is a most beautiful introduction to that time period for children, and an unforgettable classic read. 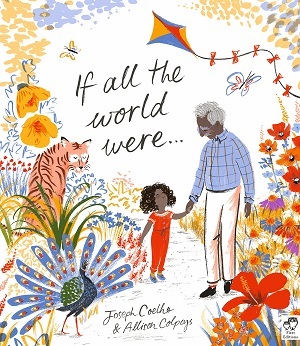 One of the best children’s books this year – do not miss. For 9+ years. You can buy your copy here. The children of today don’t seem to have the same vested need for non-fiction books as generations ago – more often than not they turn to Wiki, or use the school-provided web links to research facts for their homework. Whatever you think of this, publishers are increasingly turning to more enticing, influential, enduring ways to present their non-fiction. And seeing as children are so tuned in to YouTube for information and entertainment, sometimes looking to a vlogger who talks directly at them about a subject, what better way to present a book than as a conversation. 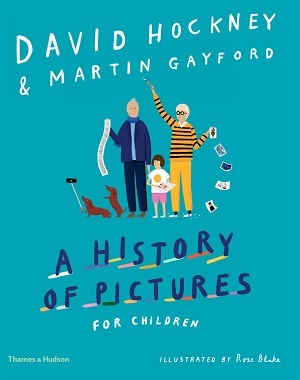 The adult version of A History of Pictures published in 2016, but now there is a children’s version, A History of Pictures for Children by David Hockney and Martin Gayford, with similar text and the same reproductions, but adapted for children in a skilful and intelligent way. 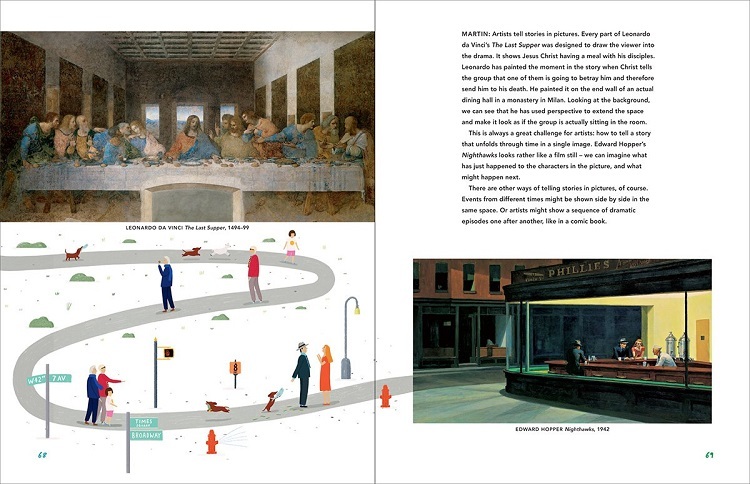 This book is a conversation between artist David Hockney and art critic Martin Gayford as they attempt to explore and explain the history of art, and yet also the creation of art. Told paragraph by paragraph as dialogue between the men, reading the book is like listening to two teenagers deconstruct a game of Fortnite. There is knowledge and depth encompassed within a pacey conversation that conveys the intimacy of friends. Their lightness of tone brings amusement along with understanding. Set into clear chapters, from ‘making marks’ to ‘light and shadows’, ‘mirrors and reflections’ and more, the abundance of full and half page reproductions of paintings lend their discussion a tone of absolute authority. For what better way to teach than by example. But rather than a straightforward look at the picture and then an explanation, as in an art gallery with plaque beside painting, this is a definite discussion in accessible yet non-condescending language. Not only is there the explanation of a painting or style from Gayford, but also interlocutions by Hockney that attempt to explore the spark of creativity behind the art. And comparisons that really illuminate the conversation, for example the similarities in use of depth of shadow in the Mona Lisa to photographs of early Hollywood stars. There is plenty for the modern child too – the last two chapters deal with moving images, and computer images respectively – not only in their creation but an analysis of where pictures will lead us – the veracity of them, their uses and potential dangers. By posing questions to each other, and answering their own, the two experts inspire the reader to really think. Each chapter focusses the reader fully on the topic in hand – I loved the pages on looking at pictures as narratives, especially Hopper’s Nighthawks, as well as the artist’s use of particular objects within a painting – Hockney’s own Mr and Mrs Clarke and Percy, as well as Van Eyck’s The Arnolfini Portrait, and the lasting influence of the objects within the painting as well as the paintings themselves. The book is titled ‘A History’ for a reason, and Hockney and Gayford skillfully talk through the changes and trends that happen within an art form – whether it be the reintroduction of the brushstroke with Manet, and the example of Berthe Morisot with a Bouquet of Violets as opposed to Bouguereau’s Mignon, or the connection of art across time and place. 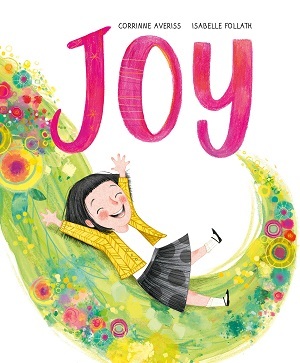 This is a fantastic and fascinating book, illustrated throughout by Rose Blake, whose friendly and warm cartoons add fun and understanding to the text. Owners of the adult version will be jealous, I presume, at the updated content here, including a new chapter complete with new examples, but for children this is a fresh and excellent deconstruction of the subject (with a timeline and glossary), but more importantly, a winning conveyance of excitement and enthusiasm for the topic. You can buy it here. 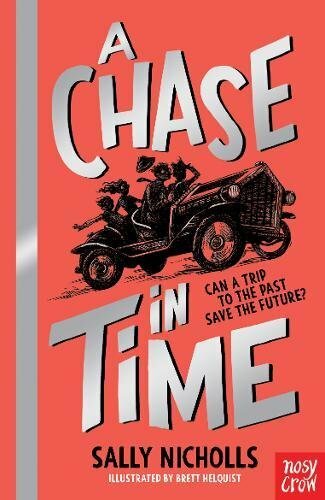 Sally Nicholls, one of our most assured writers for children, has turned her attention to a new series of time-slip adventures for slightly younger readers (confident 7+ years), and the first novel, A Chase in Time, is a delight from start to finish. Written in an accessible, abundantly clear and precise style, Nicholls wastes no time in diving straight into her plot, but also writes with one eye firmly on modernity, despite the bulk of the book being set in 1912. Alex and his sister spend every summer at their aunt’s country house, which also doubles as a bed and breakfast. This summer is to be the last; Aunt Joanna is selling the house because money is short, and things are set to be different in more ways than one. Because this summer, when Alex looks in the golden-framed mirror that hangs in the hallway, he sees another boy in the mirror – and it’s not his reflection. Before long, Alex and his sister Ruby are sucked through the mirror back in time, to the same house in 1912. And the people who inhabit it desperately need their help. He and his sister constantly refer to their knowledge of time travel – garnered from books and movies; they are immediately self-aware that they are in this predicament to solve a problem, and once it’s been solved they’ll return to their proper time in history. In fact, Nicholls is clever here. Not only do we really feel Alex’s character through his authentic voice, but she describes time travel with fresh eyes, all the while referencing those that have gone before her in the literary children’s canon. Once Alex realises where he is, he has expectations about the past – that perhaps the rooms would all look rather like a period piece from TV or The National Trust – but he finds that they are more real, more lived-in. He also describes the rooms and people matter-of-factly, but by pointing out the differences with modern day rather than just having a bland description. And when the children arrive back in their own time, reality dawns about what has happened to the people they met in 1912. This is all brilliantly executed by Nicholls and feels like a new way of dealing with time-slip historical fiction. It’s honest and interesting. The adults whom Alex and Ruby meet are wonderfully eccentric, and the children they meet are as matter-of-fact as them – refusing to be impressed by the modern mobile phone, which of course isn’t that exciting without a signal in 1912. Equally, Ruby and Alex are impressed with some of the childhood freedoms of their 1912 hosts – the freedom to carry matches, for example. The host of influences behind Nicholls floats in the background of her novel like benevolent shadows – Blyton and Streatfield in particular – with the plot zinging from a fire in the stables to a dangerous car chase (in a very old-fashioned car, wonderfully described with the fresh eyes of Alex), and some criminal catching. 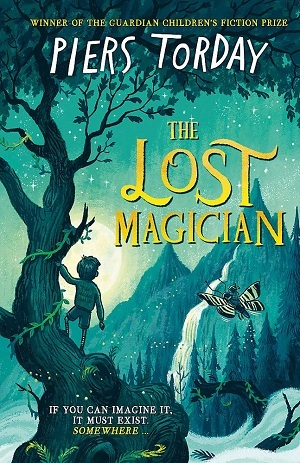 Illustrated by Brett Helquist, best known for his work on A Series of Unfortunate Events, the text is punctuated with roman numerals clocks, ships in bottles, other artefacts, and pencil drawings of the characters – child readers will note the mobile phone held by Ruby and taken with her through the mirror, which she clasps even whilst dressed in Edwardian clothes. The illustrations help to break up the text, which is in rather large typeface: these elements all combining to make this a sumptuous, satisfying and accessible read. All in all, it’s a modern classic of a book and my top choice for the summer because, in a most intelligent, perceptive and empathetic way, it portrays people who are generally accepting and kind. 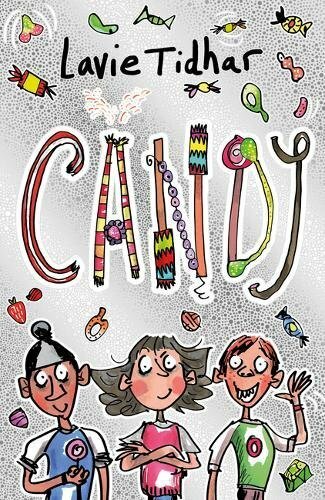 What a great introduction to reading for pleasure for new young readers. Published 2nd August, you can buy it here. 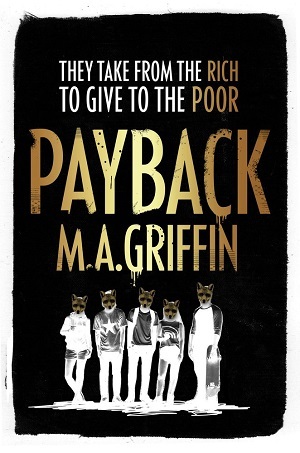 With an edgy cover that illuminates shadows of teens wearing fox masks against a stark black background, where the title winks at the reader in foiled gold lettering, Payback draws attention before the reader has even opened the book. Inside, lies a dark, gritty political thriller. Protagonist 16-year-old Tom has long been a fan of direct action group, Payback – a modern Robin Hood heist outfit who take from the rich and give to the poor, often filming their crimes and screening them on YouTube. When they target the hotel where he works, it’s not long before he’s recruited to the cause and the group, and using his acting skills to assist in their next ventures. In typical heist movie style, the reader is on board with the perpetrators of the crime, at first seeing what they do as necessary to combat corporate and government wrongs. The so-called victims of the crimes are not victims at all but evil money-grabbers, and the direct action group Payback doesn’t keep the money, but simply redistributes wealth – handing it off to the neediest in society. But the beauty of the book, which reads as a thriller, gaining momentum job after job like a train rushing through stations with the brakes off, is that it makes the reader re-evaluate the protagonist’s motives, and the moral stature of the group. Tom comes from a privileged background – something of which is he quite self-aware. And it troubles him at the same time as providing him with a cushy safety net. And Payback’s crimes are not without their innocent victims – even the ones not at the scene, such as the waiter they trick out of having a job, simply by taking his place as a disguise. As the violence ramps up, the reader becomes even more doubtful of the lines of right and wrong. In the middle, there’s some head scratching for the reader – was Robin Hood right – is stealing from the rich to give to the poor the right thing to do – and how do you work out who should be a beneficiary and who shouldn’t? And are all the privileged evil? There’s some pretty facile arguing from some of the gang, juxtaposing benefit withdrawal with champagne expenses in the House of Lords. All this talk about the balance of wealth in society makes the book current, but what Griffin does magnificently is that he doesn’t present the story as a didactic piece – just as a kind of ‘throwing it out there, think about this’ conversation. The teenagers read as pretty authentic, with the odd swear word grafted in, and the dialogue pretty spot-on – tidied of course for a prose novel – but they also come across as pretty insular and spectacularly naïve. In fact, at times every move seems more like a game to them – even a computer game – than real life. So when they set some of their money on fire, or badly misread a trap – it’s kind of inevitable that things will start to go badly for them, and that the smart policewoman who’s hot on their heels will piece it all together before they will. By and by, the reader learns that much of the gang’s motivation isn’t necessarily altruistic. However, Griffin ramps up the tension so that by the time the policewoman comes across Payback’s headquarters, the reader is in as much of a hurry to find out what happens as Tom and Payback are to get away. 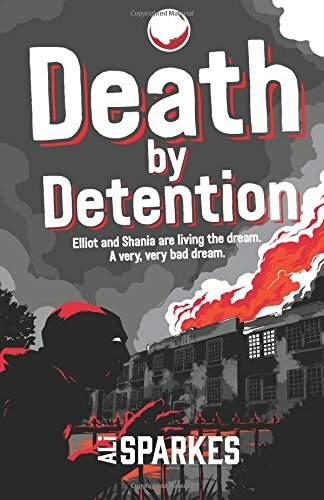 The second half of the book is a rip-roaring read, particularly difficult to put down. The idea of a direct action group making changes in society rather than the people being reliant on the government to effect change is perhaps even more current than the idea of a Robin Hood figure (although Griffin purportedly took some inspiration from Juan Manuel Sanchez Gordillo, a modern Spanish politician famous for his Robin Hood raids). The novel is highly political because it speaks directly to teenagers about how and when they could effect change themselves – and at what point a moral or legal line is crossed. With a wonderful evocation of a slightly different Manchester, in which teens lurk in spaces under arches and access free climbing walls, and terrific scenes in the dark ‘wild nothingness’ of the countryside, Griffin nails his settings with aplomb. It’s a highly visual novel with teasing chapter endings, moral dilemmas and questions about consequences, trust and justice. But most of all, it’s a thriller of a ride. Invest in this one, and you’ll have swift payback in satisfaction. You can buy it here. There’s been a glut of biographies of women recently, not only to fill the gap in the market, but also to celebrate the centenary of the first women getting the vote in the UK. But this new series, Little Guides to Great Lives, also features men, and isn’t skewed towards the women’s suffrage movement. Rather than a bound anthology of biographies, each of these biographies is a small standalone book, although they are exquisitely designed and so do look good together on the shelf. Other than their size and design, what makes these biographies stand out is the ease with which the stories are told, the fascinating details included, and the chatty tone of the prose. Including quotations from the famous people themselves, and questions about why their lives matter and what made them who they were, these are intriguing little books. The book about Marie Curie starts with her childhood – including references to her siblings, her friendships and even her likes and dislikes. Cartoonish illustrations complete with speech bubbles give pause for thought, empathy and understanding; a child reader might quickly relate to a wild child who loved lemonade and ice cream. With the world outside encroaching on her life, and a lack of money and lack of opportunity as a girl, boredom and frustration eventually turn to studiousness and adventure when Marie makes her way to France and the Sorbonne. Marie’s own scientific studies take off, and here the book really excels: explaining very clearly to the reader the science she was testing, the notes she made, the importance and relevance of her discoveries and the ongoing impact she has on science and our world. Each book in the series deals with their subject in this way – starting with childhood but not just the dry facts. The books drill down into the person’s emotional stability, the benefits they experienced or the deprivations they suffered. Successes and failures are highlighted, as well as the impact of the outer world and when they had to overcome something difficult or sad and persevere. With only 64 pages in which to accomplish the extraordinary tale of Marie Curie, Thomas keeps the prose succinct and neat, but with small dashes of personality so that it feels lively and relevant. The design is part of the appeal too. The hardback textured cover shows articles that made a difference in the subjects’ lives – Marie Curie’s is full of chemical symbols, test-tubes and writing implements, whereas Frida Kahlo has monkeys, skulls, watermelon and the Mexican flag. 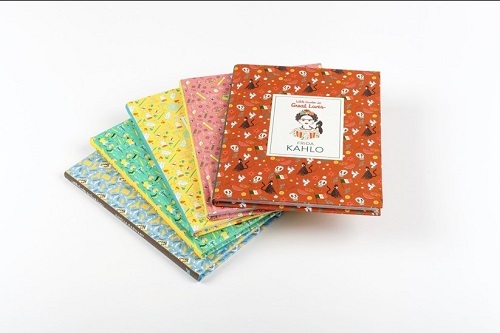 The colour theme from the cover is then extended throughout the book – each is highly illustrated in colour. The books also contain glossaries, indexes and timelines for quick glances, and so far the personalities chosen bear out an equality in gender and global significance. (The sixth title, publishing in the autumn, is Charles Darwin). Frida Kahlo publishes to coincide with the V&A’s upcoming exhibition (London), and Amelia Earhart and Leonardo Da Vinci titles tie in well with the Year of Engineering. It’s been 100 years since the birth of Nelson Mandela, so it’s fitting to have that title too. These are wonderful treasures for any child’s bookcase, and an absolute pleasure to read, share and own. I’d recommend 7+ years – but they are of equally good quality and substance for those just starting secondary school who need to do topic work. 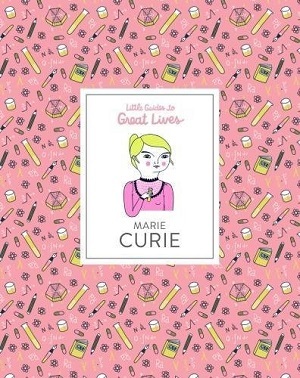 You can buy Little Guides to Great Lives: Marie Curie here. And the others here. 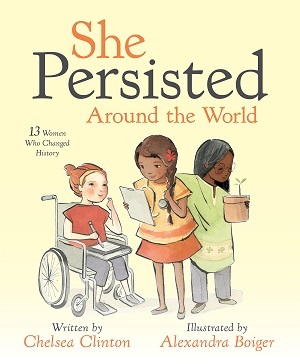 While we’re dealing with biographies, and seeing as I’ve cheated on having just ‘one book of the week’, you might also extend your wishlist to include She Persisted Around the World by Chelsea Clinton, illustrated by Alexandra Boiger. This book profiles 13 women who changed history, particularly those who were told to quiet down and had to strongly persist. Including Marie Curie, but also Sor Juana, Leymah Gbowee, Wangari Maathai, this is an unusual collection and profiles each woman in just a couple of sentences. It’s a flavour, an inspiration perhaps. You can buy it here.